Enhancement of hydropower release dissolved oxygen levels can be obtained using diffusers in the reservoir that utilize the driving force of the deep water in the reservoir to achieve high gas transfer efficiencies. The diffusers can be supplied with compressed air or oxygen from a liquid oxygen storage facility or other gas supply system. A properly designed forebay aeration system causes no adverse effects on hydro plant operation and can provide the additional benefit of decreasing anoxic products such as iron and sulfides in the releases. 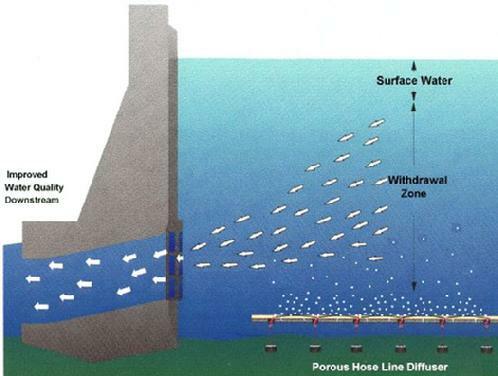 Diffusers can be designed to place oxygen at strategic locations in the reservoir and the operation of the system can be tied to unit operation schedules. 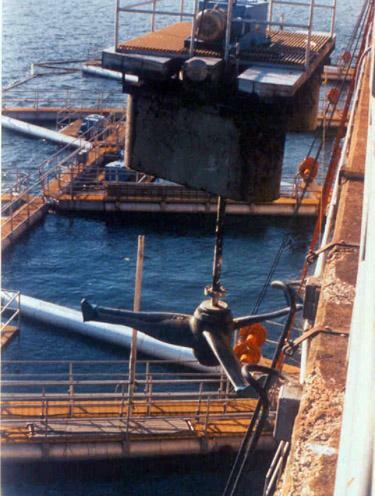 Reservoir diffuser systems have been applied to hydropower reservoirs since the 1970�s. Almost all of these systems have utilized pure oxygen to reduce diffuser size and avoid total dissolved gas (TDG) problems. A forebay diffuser system can be designed to aerate a large volume in the reservoir to handle peaking hydro turbine flows, or to change input oxygen flow rates as a function of turbine operation. 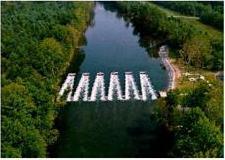 The Tennessee Valley Authority (TVA) is operating oxygen diffuser systems at ten hydropower projects. These systems were installed from 1993 to 2006. The US Army Corps of Engineers has been operating an oxygen diffuser system at the Richard B Russell hydro project since 1985. This system uses up to $1M per year of oxygen and was recently upgraded with new diffusers and controls to improve operation. A side stream super-saturation system removes a portion of the water flow from the process, adds oxygen then distributes the oxygenated water back into the total water flow. The system uses high-pressure water so that oxygen can be dissolved to levels that are far greater than atmospheric saturation limits. A long length of pipe is required to provide contact time and mixing to dissolve the oxygen gas bubbles. The super-saturated water is then distributed using a diffuser and nozzles for liquid mixing. As applied to hydropower, the water can be removed from the penstock at full pressure head, a long run of pipe then bypasses the turbines to achieve oxygenation then distributes the water through a manifold extending across the tailrace. The size of the system depends on the pressure available and oxygenation required. Aerating weirs are a zig-zag weir formation over a typical straight line weir in order to provide more linear footage of aerated flow. This achieves oxygen transfer via uptake during turbulent mixing of entrained air in the plunge pool of the waterfall created by these weirs. 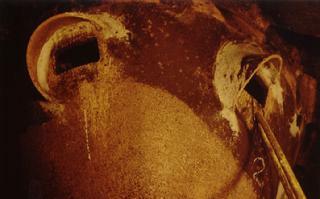 Air entrained by the overflow nappe is introduced into the plunge pool where the bubbles are sheared and mixed. Aerating weirs can be characterized as passive aeration structures with high aeration potential, good reliability, and long life. Weirs are capital intensive but have very low maintenance requirements. Weir aeration is a function of flow rate, drop height, plunge pool depth, entrained air flow, water temperature, incoming oxygen deficit, and plunge pool turbulence. High-performance aerating weirs can significantly exceed the aeration of conventional linear, free-overfall weirs. More recent innovations include a hybrid labyrinth-infuser (i.e., labyrinth fitted with narrow infuser deck around its crest) that blends the head-discharge efficiency of the labyrinth crest with the high flow performance of the infuser. Aerating weirs can be constructed at or downstream from powerhouses. When located a mile or two below the dams, the weirs can also be used for minimum flow maintenance. Storage behind the weir is drained slowly through regulating valves to provide a constant minimum flow between periods of hydrogeneration. The concept of turbine venting is based on utilization of low pressure zones that form within hydraulic turbines during operation. The low pressure zones may be �tapped� to entrain air in the turbine discharge for tailrace dissolved oxygen enhancement. There are basically two prerequisites for utilizing this method. The turbine must be of the Francis type and the distributor centerline must be preferably more than 6 feet above tailwater elevation. The setting above tailwater is required to provide the necessary negative (gauge) pressure differential to draw air through the turbine. Surface water pumps move highly oxygenated surface water down into the withdrawal zone of the turbine to dilute and improve the DO content of the turbine discharge. Surface water pumps have been applied to add 1.5 to 2 mg/L at two large TVA projects where the intakes are 60 to 120 feet deep and the total turbine discharges are up to 19,000 cfs. The pumps are composed of large diameter impellers that are suspended from a flotation frame that also supports the electric motor and gear reduction box. The effectiveness of the surface water pumps is a direct function of the DO content of the surface water and the amount of water that is moved into the turbine release. Any operation of surface water pumps will have corresponding increase in temperature. 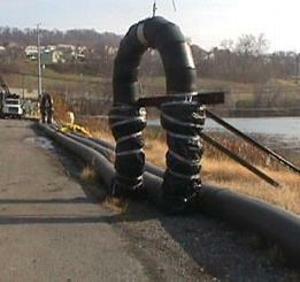 Surface water pumps have been applied successfully at TVA�s Cherokee and Douglas hydro projects. 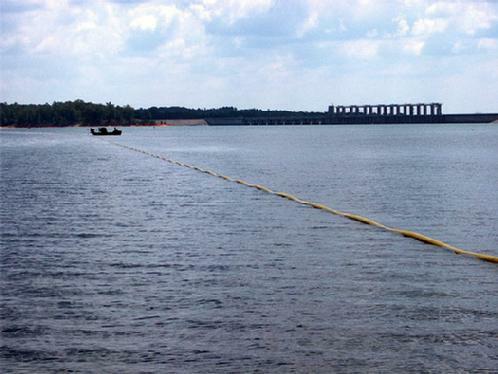 Other attempts were abandoned at the US Army Corps� J Percy Priest and Union Electric�s Bagnel Dam.